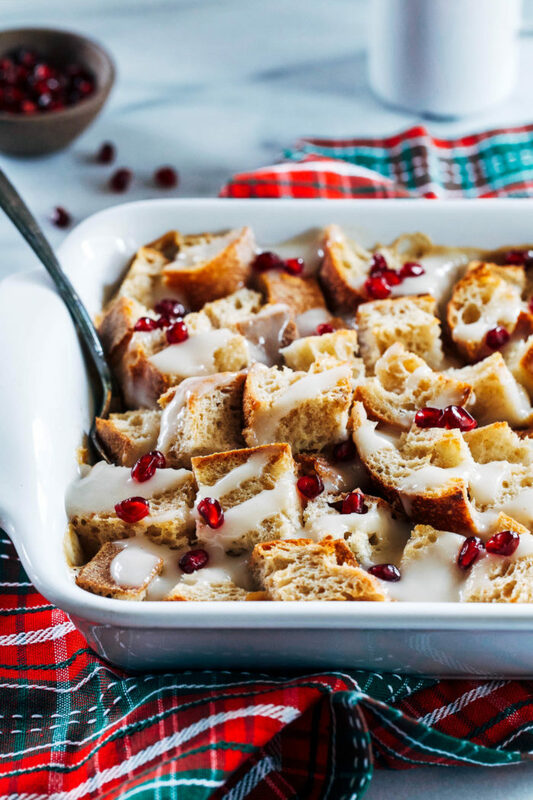 Overnight Vegan Eggnog French Toast Casserole- just 10 ingredients and 10 minutes to make, this casserole is the perfect festive dish for your holiday brunch table! Can you guys believe we only have 2 weeks left until Christmas? Every year these last couple of months just seem to zoom right by. I’m fortunate in that my family has agreed to forgo exchanging gifts this year. It relieves so much pressure not having to think about what everybody might want and actually get use out of. This way we can just focus on spending quality time together and enjoying delicious food. When it comes to the holidays, I like to make a homemade meal for almost every course. Meaning that breakfast is usually more like brunch with a wide variety of options. 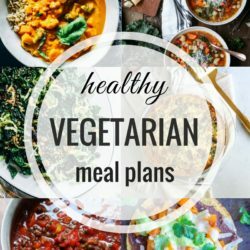 Lunch is lots of snacky foods like hummus and vegan cheese with veggies and crackers, and dinner is a special occasion meal like stuffed shells or wellington. After spending so many years working in the restaurant business and in healthcare, I finally have time to enjoy my time off so I make the most of it by preparing good food. 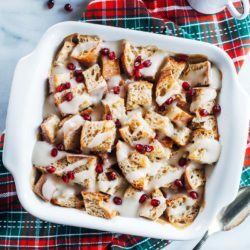 This Overnight Eggnog French Toast Casserole was inspired by a non-vegan version I made years ago. 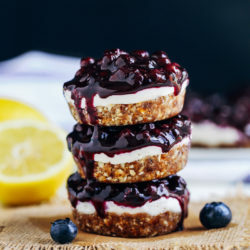 I’ve been enjoying the challenge of recreating some old favorites without dairy or eggs, especially when they turn out even better than the original. 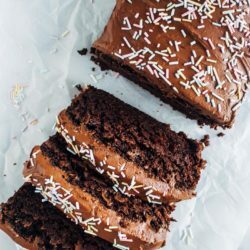 This recipe is so simple. 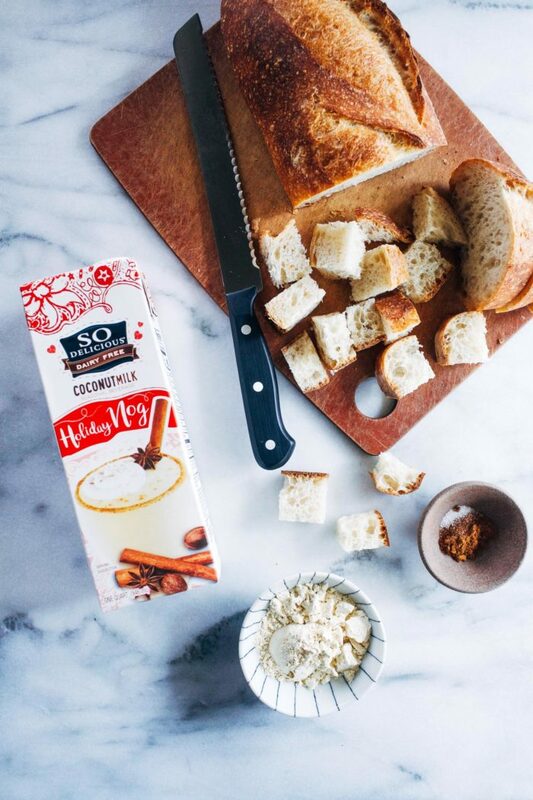 All you have to do is whisk together store bought dairy-free egg nog with chickpea flour and a few spices then pour it over cubed bread. It literally takes less than 10 minutes to make. I decided to make it extra fancy by whipping up an eggnog glaze that is just eggnog whisked with a few tablespoons of arrowroot starch to help thicken it. It’s not necessary for the recipe but it does make it look ten times prettier. 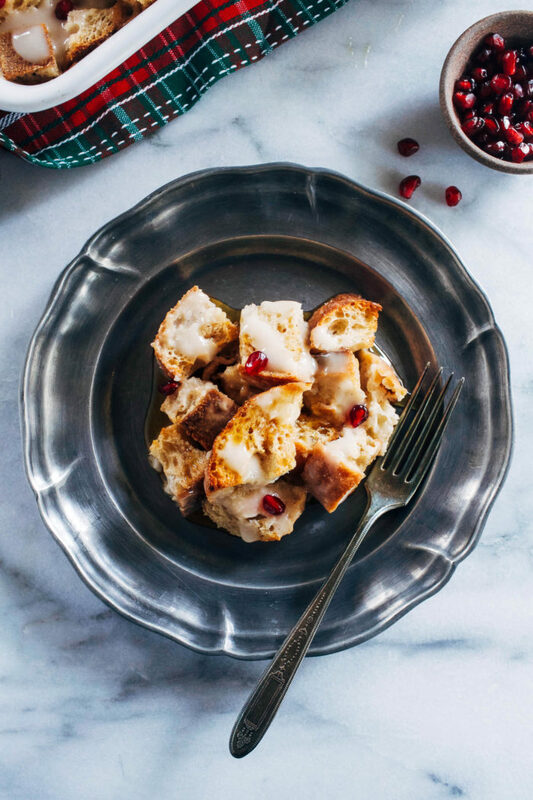 Topped with the glaze and a sprinkle of pomegranate seeds for color, this casserole is sure to impress everyone at your holiday brunch table! Lightly grease and 8 x 8” baking dish. Arrange the bread cubes in the dish then set aside. 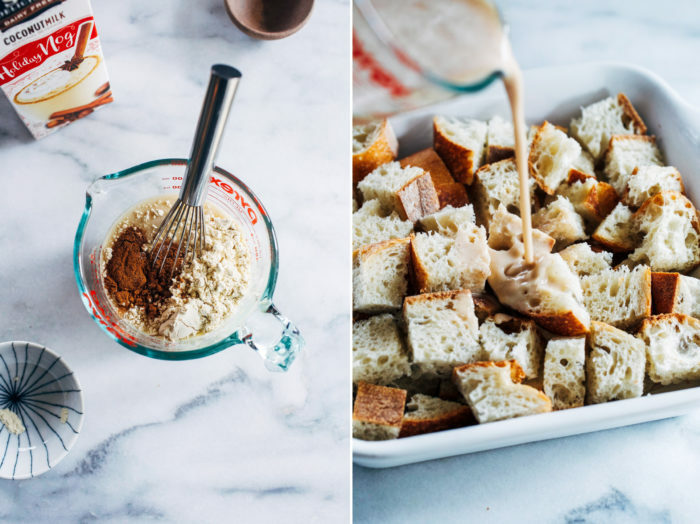 In a small bowl, combine the egg nog, chickpea flour, vanilla extract, cinnamon, nutmeg and salt. Whisk until smooth. Pour the batter over top of the bread, evenly coating each piece. 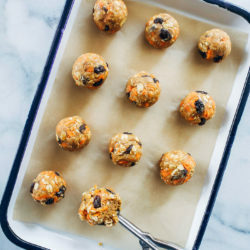 Cover and refrigerate for at least 1 hour, or up to overnight. In a measuring cup, add the egg nog and arrowroot powder. Whisk until smooth and well combined. 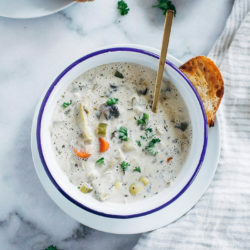 Pour into a saucepan and warm over medium-low heat. Bring to a low boil for 1 minute then turn off heat and allow to cool. Transfer to a bowl and refrigerate for at least 1 hour, or up to overnight. When ready to serve, preheat the oven to 350°F. 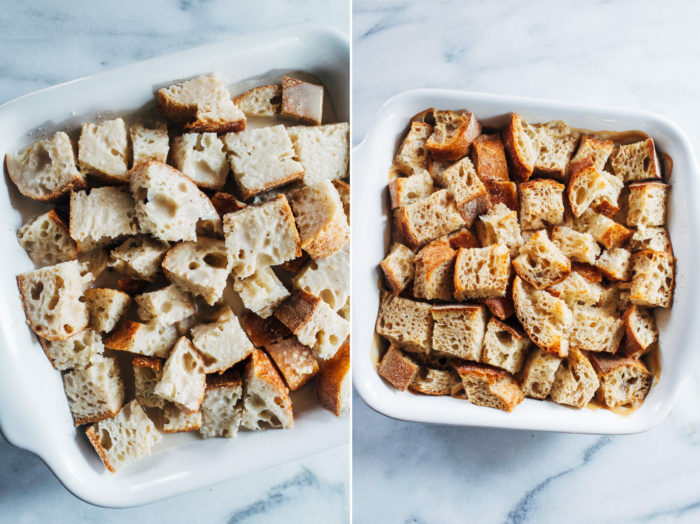 Remove cover from baking dish and flip over the top pieces of bread so that the wet portions are facing up. Bake in the preheated oven for 30-35 minutes, until liquid appears firm and bread is light golden brown. Set aside to cool for at least 10 minutes. 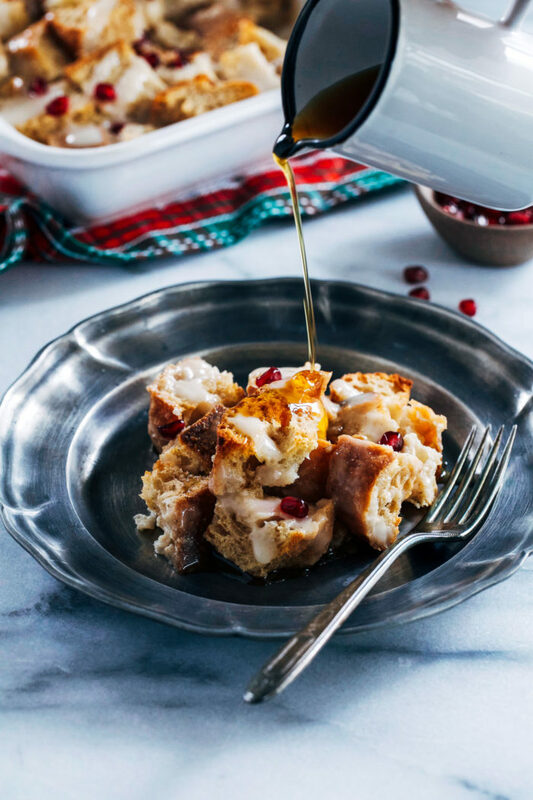 Top with eggnog mixture and pomegranate seeds (optional), serve warm with pure maple syrup, and enjoy! 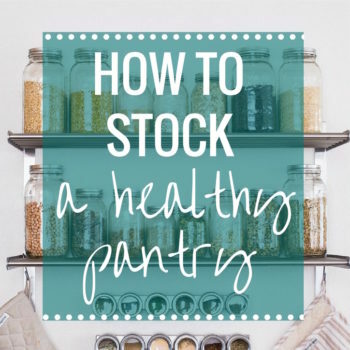 *If using gluten-free bread, I recommend letting it soak for 30 minutes, not overnight. I wish my family would get on board with skipping gifts! We don’t need anything and you’re right that the whole shopping process gets so stressful. Luckily, Riley and I just do little stocking stuffers, so nothing big there! Brandon and I don’t get each other anything either and that definitely helps. Saves so much money when you don’t have to spend on it gifts! 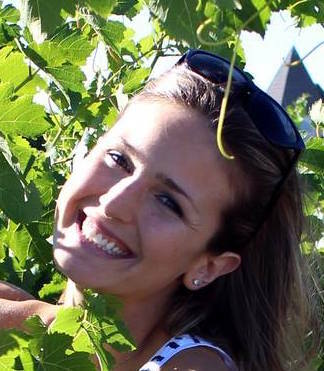 My family stopped the gift-giving tradition a few years ago, and it was such a breath of fresh air! No one feels like they have to scramble to pick out the perfect gift for everyone, and we spend the holidays in a more meaningful way – just chilling and cooking. 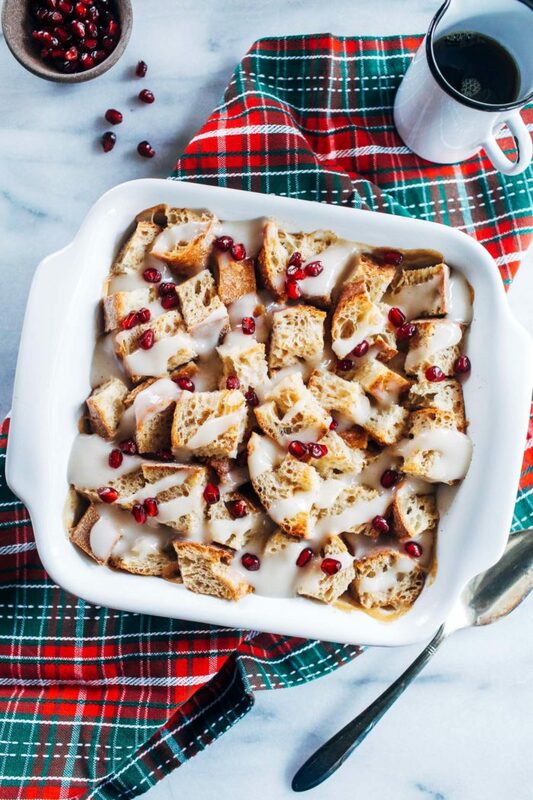 This bread pudding looks amaaaaazing! My family would absolutely love this Christmas morning! I’m not really sure if I’m an eggnog person but I bought some eggnog gelato to try out this weekend. lol. 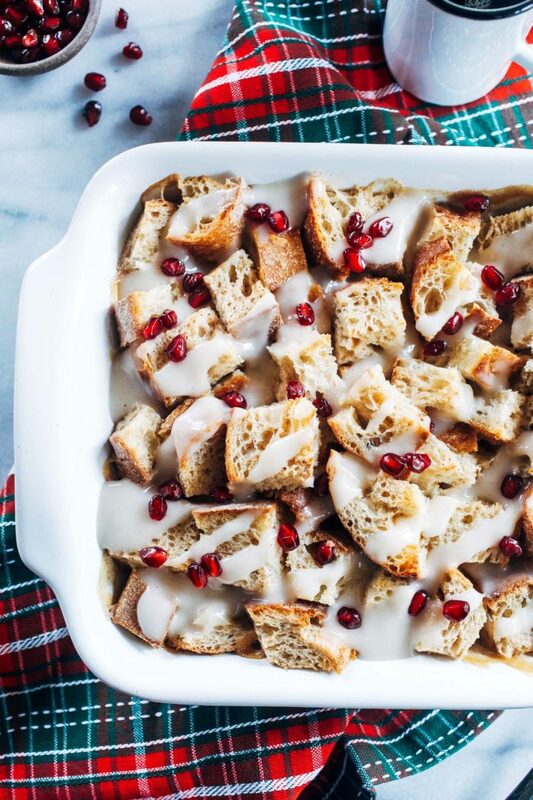 So healthy, I know…but if I like it then I think I’ll go get that Trader Joe’s Almond Milk “Eggnog” and try this recipe out for breakfast on Sunday! I like that your family agreed not to give gifts. We kind of agreed in our family we wouldn’t either now that we have Camryn it seems silly for us to get gifts when we’re not the “kids” anymore. I think my brother was sad. haha. Eggnog is definitely not for everyone. Brandon doesn’t care for it but he liked it in this casserole. Yeah, that’s what finally made our family forgo giving gifts- when my brother had his first baby. He just had number 4 a few weeks ago so there are plenty of kids to buy for now, lol! I am addicted to this eggnog this year! I can’t get enough. And wondering if it’s possible to sub another gluten-free flour for the chickpea flour? I have Bob’s Red Mill on hand as well as Namaste, buckwheat, rice flour, etc. I haven’t tried it with other flours but rice flour might work!